Is there any correlation between maximum extent and eventual minimum extent figures in the same year? The minimum extend is more dependent on the winds. 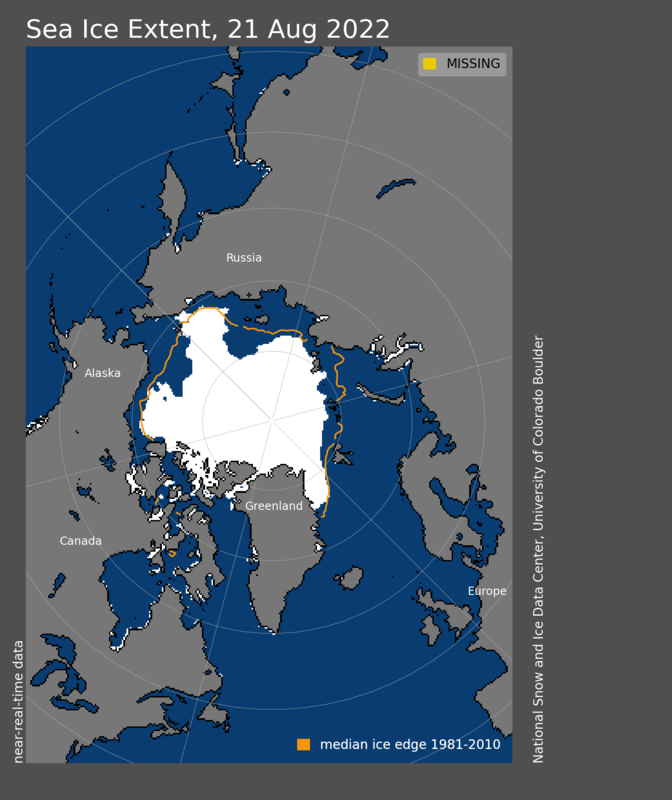 If the winds keep the ice in the arctic it generally doesn’t melt very much. If as in 2007, you get a major storm that pushes the ice out of the arctic through the straits and into the warmer oceans, it melts. The air temp last year was below normal the entire summer indicating the sea water was also probably a bit cooler. Note the temperature is quite even during the summer and swings wildly during the winter. That is the open water modifying the climate during the summer. 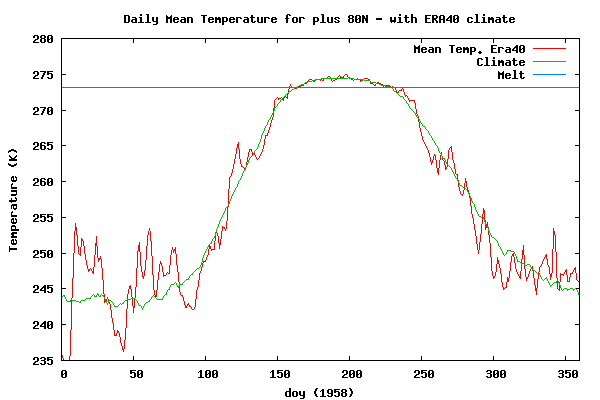 1958 was actually warmer all summer compared to 2013 AND above freezing for a longer period of time. OH NO IT IS’NT !!! The peak for the period is 2010 and 2012 and *we are* very close to that. almost every day and the extent over some regions in N. Canada is already above average. The ice has been growing steadily, especially between Canada and Greenland. The only problem is in N. Asia, where it’s stable or receding a little. The blue areas over the ocean are becoming smaller. 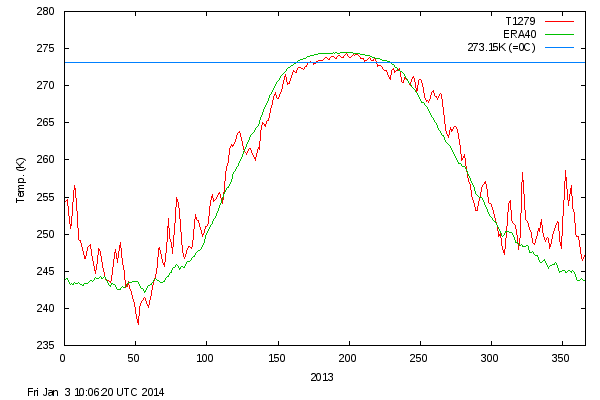 IMO there is a real chance that the Arctic ice will be above average (in the total extent) in a few days or weeks. “blue areas over the ocean” : between the orange median line and the white snow covered area. Why don’t you check the NSIDC’s data instead of just eyeballing a pretty picture? Here’s a useful image for you. Turn on all the pretty coloured lines and then hover your mouse over them. Then you’ll be able to tell me which years had a lower extent than 2014 for the most recent date available, won’t you? If you continue promoting your blog here, you are going to be spam. A wonderful site, expertly written. Thanks for the shout-out, Eric. I wondered why there was an influx of viewers at my site from this site. My site is sort of like a messy notebook full of observations. Unless you are a weather geek, it is way too long-winded. This site is much better for quick updates. I don’t see how Steve does it., day-after-day, month-after-month. Steve has noted the real news is the increase of thicker ice over towards the coast of Alaska, and even north of the Bering Strait. The lack of ice in those areas was the main reason the “extent” graph got so low during recent summers. It will be interesting to watch this year. My guess would be that the area will not melt and the extent-graph will not dip so low. Great to see your articles in WUWT! I wish you would be a little more self-promoting, though, and give prominent links to your own site when you write such articles. That’s the least you should expect for providing your talent to wuwt. Keep up the good work! And lets see what happens this year, let’s see if we get more ice as a minimum than last, and then the warmist gooses are cooked. I am planning to improve my site, but never seem to find the time. I’d rather do what I most enjoy. However, against my will, my mind is being forced to be more down-to-earth. It happens every year, and is called “doing my taxes.” Maybe, while dragged down to earth, I’ll do some work fixing my site up. Watch the sea-ice this summer over on the Bering Strait side, especially the Chukchi Sea graph. It has become totally ice free recent summers, but barely managed it last summer. If it fails to become ice-free this summer it will suggest it is the PDO and not CO2 controlling the ice-extent on the Pacific side. If the Chukchi doesn’t completely melt, then ice in the Central Arctic between the Chukchi and the Pole will not melt, and that added over a million km2 to the ice-melt during recent summers. I like using my own eyes by checking the satellite view, but (if you can put up with a bit of data-diddling,) it is interesting to check out the graphs of ice-extent of the northern seas at http://arctic.atmos.uiuc.edu/cryosphere/IMAGES/recent365.anom.region.10.html You can move from sea to sea by clicking on the map at the bottom. Hope you get a chuckle from it. The way for humans to end global warming is for all good liberals to off themselves because the rest of us aren’t concerned about whether or not earth has a temperature. Such an action would solve so many problems simultaneously. To all liberals: LEAVE ME ALONE. That would fundamentally violate their religion. Steve – If there was a facility for including images in comments here then I wouldn’t need to link to images elsewhere, would I? Was reading some of Joe Bastardi’s twitter stuff. The AMO was mentioned and I know Steven and others have mentioned it before. It has a strong relationship with Hansen’s 1999 global temperature chart before that was massively adjusted. Looks very cyclical to me.